The Fifth Delhi University (DU) Cut off list 2017 has been announced by the university on 18th of July. This year, the university will release only five cut-off lists. Though the colleges which still have seats left, might release further cut-off lists they will only be individual college based. Make sure that you subscribe to the website in order to get all the updates regarding Fifth Cut Off 2017 of Delhi University. Many North Campus and South Campus colleges started rolling out the DU 5th cut off list 2017, a day prior to the scheduled on 18th of July. These colleges include Hansraj College, Hindu College and Motilal Nehru College. The 5th cut off list is the last cut off list by the Delhi University for the year 2017. Most DU colleges have already closed their admissions for many Science courses. The science courses offered by the Delhi University are BSc and B.Sc (Hons.). The admissions that are closed are for all the categories such as General, OBC, SC, ST and PwD. There hasn’t been any significant fall in the percentage in the final cut off this year. It is due to the reason that almost all of the colleges have already had their seats full for most of the courses. Also : Check out the list of Documents required at the time of admissions. As most Delhi Univeristy Colleges already have their seats fulll, the DU 5th Cut off list would fail to bring much cheer. There hasn’t been a fall of more than 2 percentage points . For most BSc and BSc (Hons.) 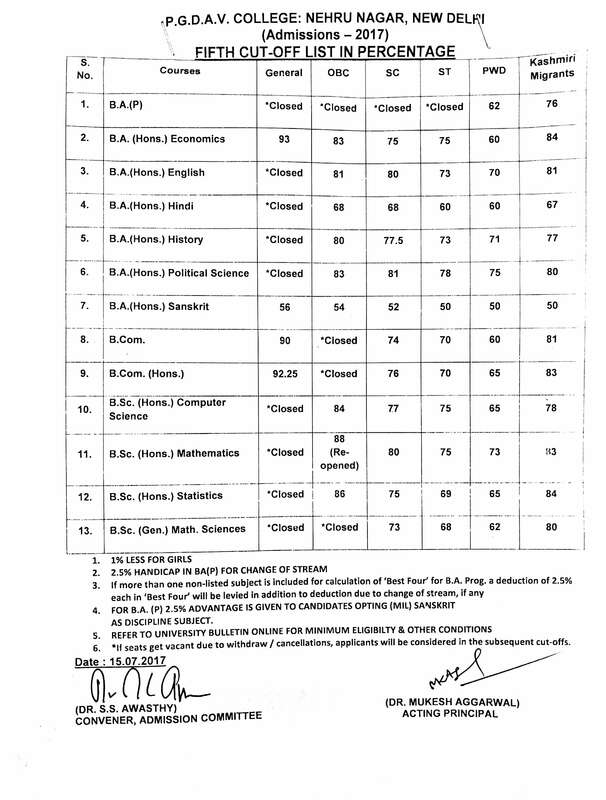 courses, the admissions are closed in fifth cut off list. Few colleges have closed their admissions but there still are chances to get into good Science Colleges. Aspirants can watch out for admissions against cancellation. It might help in getting into good science colleges. A lot of students take admissions against cancellations every year. UPDATE : Get combine 5th DU cut off list from the links below. 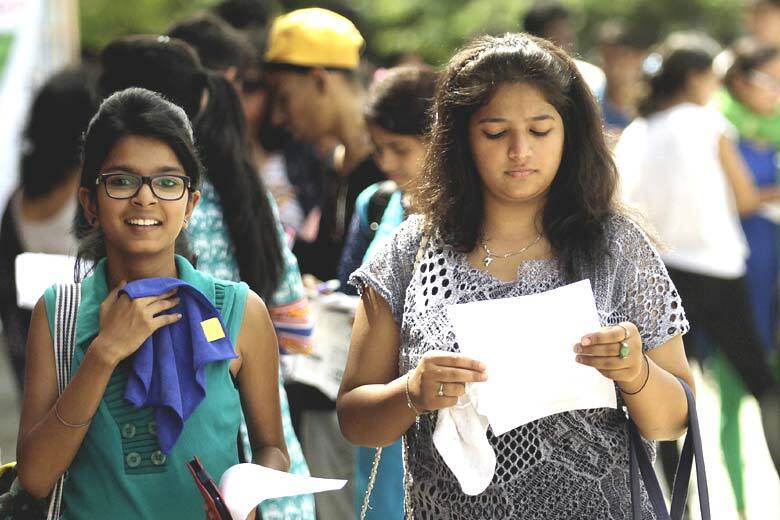 After the fourth cut off list, it was quite expected that most Delhi Univeristy colleges would have their UG admissions closed in Commerce courses (BCom and BCom (Hons.)). A large number of students apply for commerce courses and they have always been the most sought after courses of Delhi University. Shri Ram College of Commerce (SRCC), has also closed the admissions for commerce courses but the college has kept the admissions open for BA (Hons.) Economics in the 5th cut off list. Most Colleges have admissions open for Humanities courses (BA) but only a few seats are left available in the 5 th cut off list. ]Shri Ram College of Commerce still has admissions open for the BA (Hons) Economics course for the students belonging to all the categories. BA (Hons) Economics is the only Humanities course that SRCC offers.